…fixing our eyes on an ideal may make us sad. The more beautiful something is, the sadder we risk feeling. We are reminded of the way we wish things always to be and of how incomplete our lives remain. Houses can invite us to join them in a mood which we find ourselves incapable of summoning. The noblest architecture can sometimes do less for us than a siesta or an aspirin. My grandparents’ chiming clock acts as a paperweight for my memories. The depiction of creator and creation, hanging in our living room and painted for me by Aboriginal artist, Vincent Serico does periodically call to the surface some submerged filaments in my character. 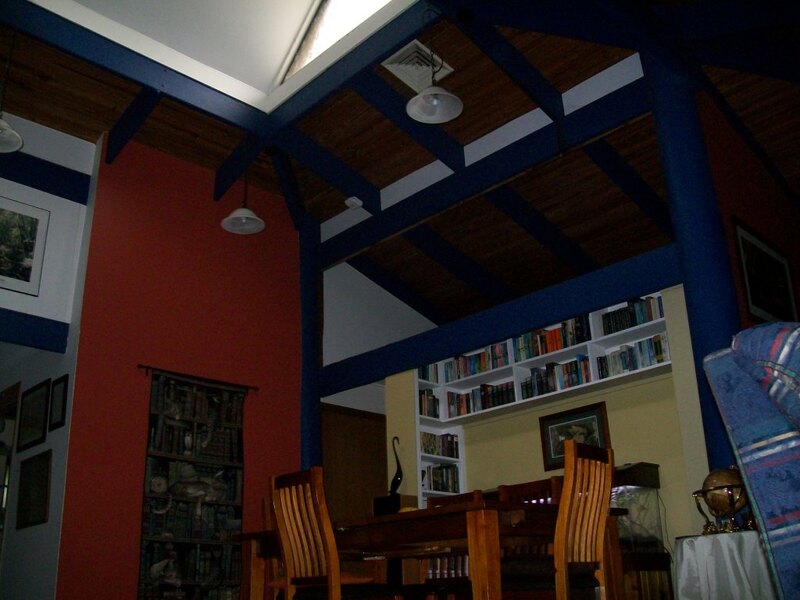 And, when I haven’t had enough sleep, I can get curiously emotional just gazing at the vaulted, timber cathedral ceilings in our home; the imperfections of which, especially during heavy rain, can lead to the need for aspirin! ~ by Garry on April 17, 2011.